I wanted to piggy back on something @Tommer mentioned: adding references to other KB articles. 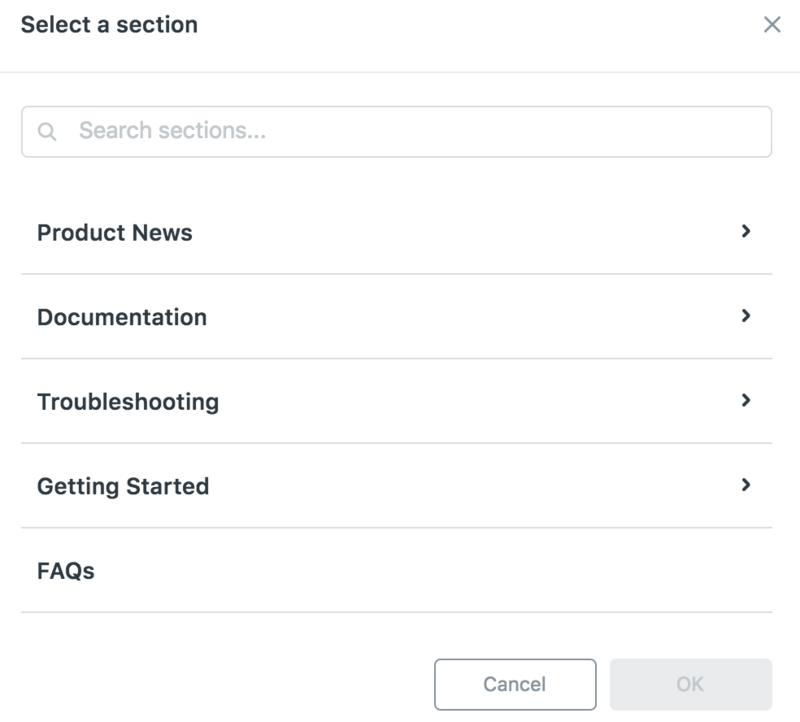 I understand the usage of anchor links, but I was wondering if Zendesk has the ability to suggest KB articles, or if there's a nice option to link to them by selecting from a dropdown somewhere? We have a "related articles" component available in the Help Center, which you can find out more about here: Help Center template component reference. This doesn't allow you to select which articles are related to others, so it might not be the right solution for you, but it does take into consideration the articles your users have viewed prior to the article in question, and over time the traffic patterns in your Help Center will naturally build up those relationships for you and show relevant related articles to your users. That certainly seems like a step up from at least not having anything. There wouldn't happen to be any way to modify the "relatedness" of articles? Possibly through the API even?? I would just hate for users to casually browse the KB, and have completely unrelated articles end up becoming related. How do I setup an internal knowledgebase? I am trailing the Plus plan from our starter plan. The use of an internal KB would be very useful to us but I can't work out how to set that up. The Internal KB feature is available on the Plus and Enterprise plan, so this will definitely be available to you while you're trying out the Plus plan! I may have missed it, but I don't see clearly specified the relationship between org restriction and tag restriction. We want users to see the article who have the specified tag OR who are in the specified orgs. Is this how it works? Thanks. You are correct. The Organization Field does also have approximately a 1000 character limit. Hi, we are looking to use Zendesk to replace our Wiki environment. We have a lot of end users registered to whom we would like to grant access to build the knowledge base. Is there anything we can do besides changing all of their roles to light-agent? Making end-users into light agents would give them access to your tickets so I would strongly advise against going that route. The Zendesk Help Center isn't built for wiki-style co-authoring/editing functionality. My best suggestion would be to use software that's built for that particular type of community, and use Zendesk for your ticketing and any other traditional documentation you might need. This code will reference the asset link provided when you upload your video. Of course you can modify any of the details in the link as needed. I hope this works for you! Is there a way to add multiple labels at once, starting from copying a list of keywords form a text file, for example? If you copy/paste a string into the label box, it'll be read as a single label because labels can have multiple words separated by a space. However, once you've added labels to an article, all those labels will show up in a handy drop-down box the text time you click inside the label field. This way you can quickly click the articles you want to add, instead of having to type them out every time you need them. Hopefully that helps! Please let me know if you have any other questions! Hi Jessie, and thanks for the reply. My goal is to populate the 'labels' field with several words, in different languages, at once, whenever I create an article. It is a matter of SEO, in fact. I know that there is a script, which can be used if you have developers' permissions, and I am going to discuss this with ours. But I like to solve problems efficiently :) and I am seeking for a quicker solution. I have tried to use tab and comma separated list of word, but still they will be recognized as single string, which seems quite a big limitation, since Zendesk default search engine is poor: it looks for result corresponding to single words and completely neglect a whole phrase, since it splits it in single terms. I hope this helps clarifying. We ended up using the code below. The video is embedded in a <video> tag instead of an <iframe>. Although <iframe> worked, it caused the video to autoplay. Using the <video> tag instead prevented autoplaying of the video. I wish I had a better solution to this issue for you. I'd suggestion popping over to our Product Feedback Forum and posting your suggestion there, along with your detailed use case. Posting in that forum will ensure that our Product Managers see your feedback, and will give other users the opportunity to upvote your suggestion and add their own voice to the discussion. Our PMs take this type of feedback into consideration when establishing our road map, and a detailed explanation of your use case helps them to understand the problem that you need solved. Is there a way to prevent end users from being able to copy the embedded code for videos? The only means available for end users to access the code of the Help Center would be using the Developer Console in Google Chrome or another browser, for example. Or some other tool that renders web page code to be accessible. There is no means to block the Developer Console of browsers from accessing the code of the web page. This is something outside of Help Center that is true for all web pages rendered in browsers that have these Consoles. Is it possible for end users to be able to search by author? Help Center only searches the text of articles, not user profiles, so unless that author's name appears in the body of an article it won't show up in search results. Is there any way to tag content in an article so that it doesn't display? 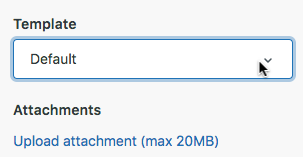 I have an existing topic that needs to be updated in a few weeks but if I change the topic to "Draft" it won't show up now. In RoboHelp you can add content then tag it and when you generate, it will exclude the tagged content. If you do not have a feature like this any plans on adding one in the future? We don't have a feature to mark portions of an article as draft, but you can temporarily hide any part of an article with the HTML comment tag, <!-- text -->, in the article's Code view. Only the first paragraph will appear. You can use the comment tags anywhere, including at the word level. When you're ready to make the content public, just remove the tags. Charles thanks for the quick reply. This is extremely helpful. I will try this out. Are there plans to allow Support staff to have access to view a list of their own content and the state the content is in (Draft or Published)? Right now they can get a list but it does not show the state of the article. I hope I can help you here. 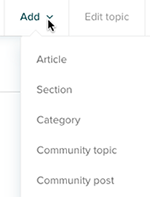 Under Articles>Manage Articles, there is a little traffic light on the left hand side indicating the article status. Yellow for draft and green for published. Hi. Yes I have seen that. However, Support Engineers do not have Manage Articles permission. So once they save a document the only way to see the docs they created is to go to their profile and click on Help Center. That view only shows the article Title, Section, Created date. It does not show the status. Further, we use labels to simulate an article going into a technical review Queue, quality review Queue, or archive. There is no way to see if an article has that label (as is in the simulated "queue"). There should be a simple way to customize the view and add columns to show what is needed. Thanks for that explanation. That sounds reasonable to me. I guess including some temporary text in the article title could help, but not very satisfactory. No since those articles are customer facing. The best solution, is to allow agents to customize their view by adding what columns of info they need to see. 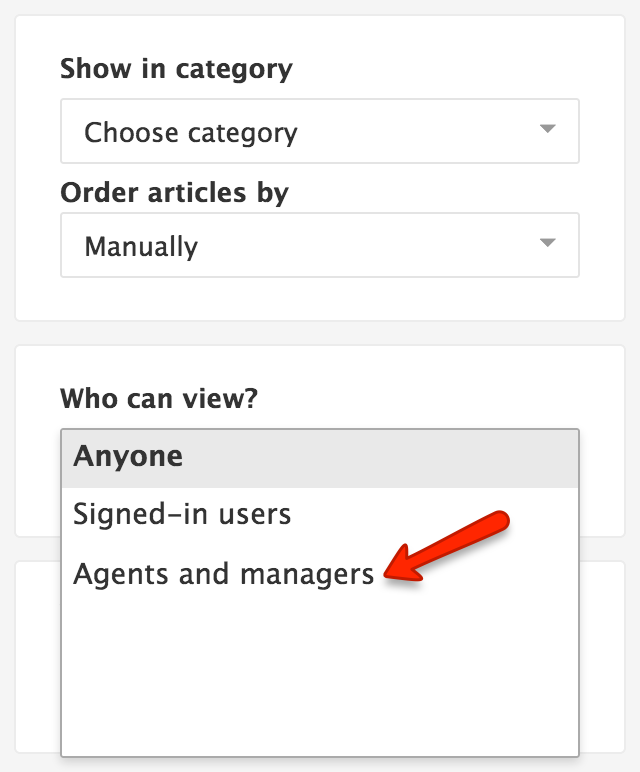 Or, allow manage articles to agents so they can create filters to find particular documents. Manage articles should be a right for all users. Separate from the other Admin tasks of Arranging articles, adding sections & categories.